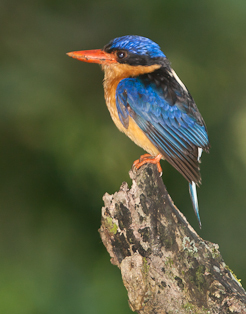 Our icon species, the Buff-breasted Paradise Kingfisher, nests in the Lodge grounds, arriving from Papua New Guinea usually from mid October to early November. This can vary from year to year and is unpredictable. 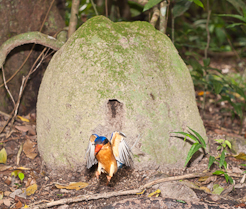 We usually have 6-7 pairs nesting, each choosing a rainforest termite mound of the species Microcerotermes serratus. They have over 40 mounds on the property to choose from and don't always use the same one as the previous year. When they first arrive they are difficult to see as they are often high up in the rainforest canopy selecting territories. 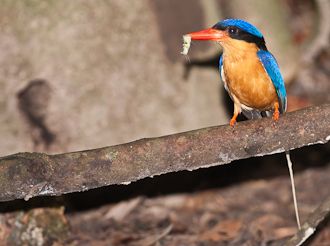 This behavior usually lasts for a few weeks before they pair up and begin building their nests in termite mounds on the rainforest floor. Usually the female chooses a nest site. By this time it is December when egg laying usually takes place. Incubation period is 26-28 days and fledging period is a further 26-29 days, which takes it into into late February or early March. When birds are feeding young they are more easily seen as they pounce on food items on the ground and come out into the open more readily. Once the fledglings emerge from the nest they tend to sit quietly in the rainforest waiting for their parents to bring food. After a further 32-33 days they are able to feed themselves. 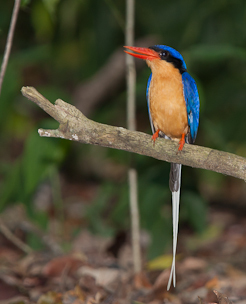 They depart for Papua New Guinea from March/April with the adult birds often leaving first followed by the youngsters. The latest departure recorded from the Lodge is May 7th. They can be seen anywhere within the Lodge grounds, but it can take a lot of patience to track them down, especially when they first arrive. February to mid-April is probably the best time to see them but it is also the "Wet Season" so weather conditions are unpedictable. 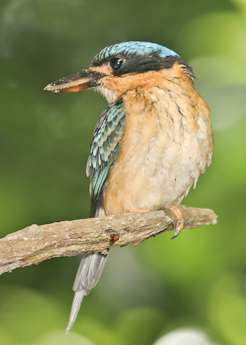 However if you are prepared to put in the time you will be well rewarded with sightings of this most spectacular Kingfisher.